Milton Friedman once gave a lecture in which he demonstrated, in a very particular logic, that the so-called “free lunch” was a myth. The origin of the term is unknown, but in early twentieth century it was already in use. Since then it has been so frequently employed that people have been explaining and rationalizing over it up to the present. In physics, to do something – which is called “work” – is to spend energy, and so, physically speaking, there is nothing ever for “free” (free from some energy usage). However, in economics, “free”, and particularly the “free lunch” term refers to an opportunity cost that always exists, because the human imagination is infinite (at least in possibilities), and the Earth resources are limited. So, Friedman’s logic is that there will never be a “free lunch” because spending money somewhere always takes money away from something else (the opportunity cost). Others believe, however, that these “costs” and the inability to provide “free lunch” is only a reflex of a scarcity mentality that, for instance, considers that money – an imaginary construct – is finite and that its management amounts to a zero-sum game (if I win, you lose). An alternative belief is that, while acknowledging that physical resources are scarce (Earth is a finite planet), their distribution can be made available to everyone, and we could be living in a “free lunch society”, if only we shifted our mentality of scarcity to one of abundance, and generously shared those resources among every human being on Earth. 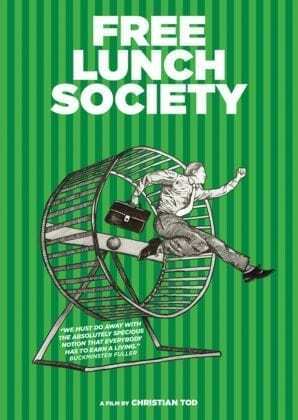 Given this introduction of the “free lunch” dilemma and what could be the transformation of our way of life into a “free lunch society”, Christian Tod, an Austrian economist and filmmaker intelligently used the term to name his most recent production: “Free lunch society”. The film is due to come out on iTunes on January 22th 2019 and on DVD on February 5th 2019. Previously, a short version of the film (50 min.) had already been presented at the Basic Income Earth Network’s (BIEN) Conference at Tampere, Finland, last August 2018. “What would you do if your income were taken care of? Just a few years ago, an unconditional basic income was considered a pipe dream. Today, this utopia is more imaginable than ever before. FREE LUNCH SOCIETY provides background information about this idea and searches for explanations, possibilities and experiences regarding its implementation. BIEN, Consider the Global Resource Bank Free Lunch Society at GRB.net.